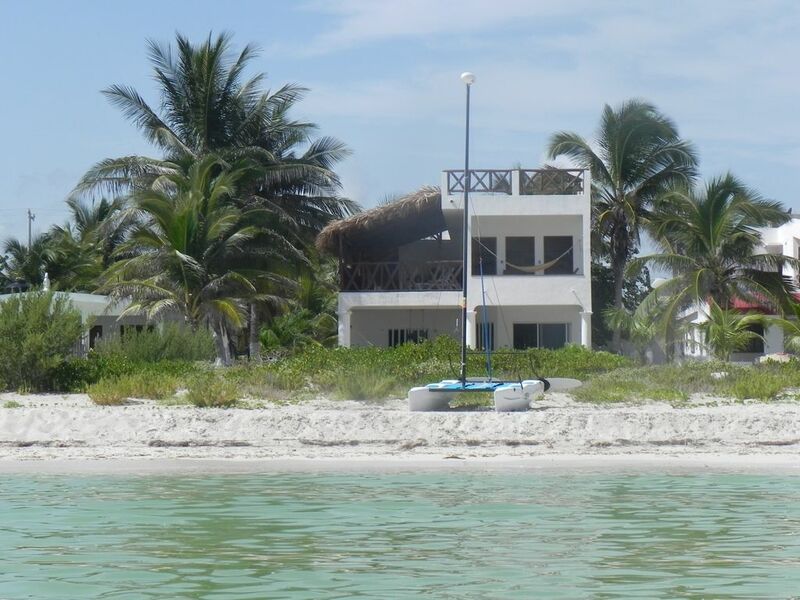 "La Casa en el Aire" is a Kiter´s and Yogi´s Dream! It is a comfortable and airy two-level-house directly on the beautiful sandy beach with palm trees around the house. Assemble your kite on the terrace and take off kiting directly in front of the house! The house also features a spectacular roof terrace with lounge area, perfect setting for your Yoga sessions too! look at the video posted it has been filmed in our house during a women kite and yoga retreat at our house in 2017. The lower level of the house has two bedrooms, two bathrooms, a fully equipped kitchen and a living room with a large lounging area, a shaded terrace facing the beach and a covered dining aera behind the house facing the garden. The up-stairs of the house features three bedrooms, two bathrooms, a huge shaded terrace with a bar area and a palapa for the kids. Note: second floor not suitable for very small children - only under permanent adult supervision (balcony gaps)! The water pressure is not great in the up-stairs bathrooms, it´s more convenient to shower in the down-stairs bathrooms. Water pressure is a known problem in Mexico, we tried several pressure pumps but the salty and humid air is not favorable for them. Both downsstairs showers offer good water pressure (due to gravity) and have also both cold & hot water. N E W: We now have WIFI internet available! The signal comes with a micro wave connection from Tizimin, not 100% reliable but working most of the time. Also the use of an AUTOMATIC MOTORROLLER is now included in the rent of the house, only an additional security deposit is need for the motorroller (see photo). It is a lot of fun exploring the village on the motorroller (seats 2 people). We offer a base rental price for up to 7 people and for bigger parties we charge US $ 25/night per extra person (max. 10 adults and 4 kids). Please note that we never rent the house to different parties at the same time! The beach is kid friendly as there are no dangerous currents and no steep declines. Enjoy walking the endless virgin beach with its beautiful palm trees. With a little luck you can spot Dolphins from the terraces of the house, mostly during early morning hours. There is almost no tourism in El Cuyo. Which also implies that there does NOT exist a touristic infrastructure either. El Cuyo offers 25 miles (40 km) of fine white sand beach, from the house to the east 9 miles (15 km) of virgin beach without any houses but lot’s of beautiful palm trees. Nature lovers will enjoy the tranquility of this location. From June to September you can take a boat tour to swim with whale sharks near Holbox Island. There are several Mayan ruins in the area. The closest is Ek Balam a 1,5h drive away. You can book tours to see the flamingos in the village. During July and August the enormous sea turtles lay eggs on the beach and hatch. El Cuyo is not a place with a lot of infrastructure, there are only a few small family oriented restaurants and a few small shops, but nothing fancy, also no supermarkets nor discos! You can buy fresh fish at the harbor and depending on season also shellfish and calamaris. You need a rental car to get around, public transportation is skatchy and the house is not in the center of the village but located a little further out. Google maps coordinates of the house = 21 30' 55'' N 87 40' 06'' W or 215153 -876684 (you will see our yellow roof terrace on google). Please note that El Cuyo is "cash only" but the closest ATM is an hour drive away in Tizimín. Beach is perfect for kite surfing and windsurfing, but you need to bring your own equipment or contact the local kite school prior to your stay to insure availability of equipment and classes. perfect getaway for a relaxed stay in paradise far from the hectic world. Miles of virgin beach with nothing but palm trees and the ocean to disconnect from today´s busy life. A kiter´s and Yogi´s dream! fully equipped kitchen because we love to cook too! we provide loud speakers to connect your lap-top. I-Phone, I-Pod, etc. in front of masterbedroom 2nd floor - attention: not suited for small children, balcony gaps! (3) huge shaded terrace downstairs, huge partly shaded terrace on 2nd floor, roof terrace with lounge area - a yogi´s dream! We have stayed in El Cuyo before and while we loved the quaint town we weren’t overly impressed with the accommodations we found. Until now. Susanne is a wonderful host and the property is exactly as advertised. I can’t say enough good things about Sara and Gabrielle (the caretakers) they were always accessible and very helpful especially since we spoke very little Spanish. I highly recommend this place. We will definitely be back. Thank you all. Amazing locale and house....Great for large groups...lots of privacy! The house was great, fully equipped and very comfortable. Located right on the beach, it was blissful to swim everyday and look at the stars from the third floor deck at night. The house had enough space, floors, and outdoor areas that even with eight of us we could find privacy and quiet. Nicely equipped for big groups with a nicely appointed kitchen. The managers, Sarah and Gabriel, were wonderfully helpful without being invasive. They provided great intel on where to eat, which boats to take, and what places to visit. The location is off the beaten path in a wonderful small and friendly village! We definitely want to go back! The motor roller (scooter) was great fun! The best kept secret !! We really enjoyed the people and the setting of El Cuyo. It was most relaxing. The rental was as described and perfect for our needs. Sara and Gabriel, the caretakers, were just lovely. We will be back !! The house in El Cuyo was perfect for our needs. We wanted somewhere remote where you could getaway and not be surrounded by people in town or on the beach. We found El Cuyo to be what’s Isla Holbox was years ago. We were able to go out into the ocean and feel like it was all ours. Some families were there over New Years but it was not crowded. You definitely need to know Spanish to get around. We took several excursions out to Rio largartos, Valladolid and Holbox. We also went fishing one morning and caught our meal. Lobster was easily obtainable and we were able to get a local woman to cook for us during our time. The house has a weak bedrooms. Good view of ocean. You can hear the waves. There is a roof terrace and lots of chairs to lounge or hammocks. Town has a few local restaurants-nothing fancy. Kitchen is well outfitted. Board games. Ocean stuff. You can’t go wrong. Big house, ocean front, parking, full kitchen, wifi... We were two families ( eight persons) and the house was big enough for all of us. Great house in a great little town. Nice quiet town. Hardly a soul in sight. We got to see dolphins, sea turtles, flamingos, and even a crocodile (on a trip to Holbox). The house is well equipped and as advertised. As in other reviews, make sure to buy groceries near the airport. There is not much else on the way or in El Cuyo. If you are looking for the party lifestyle, this is not the town for you. Beach is perfect for kiting and kite surfing, windsurfing - bring your own equipment.